Pi: It is true that those we meet can change us, sometimes so profoundly that we are not the same afterwards, even unto our names. Upon hearing that this year would see the release of Life of Pi, a 3D film adaptation of the bestselling, but supposedly unfilmable book by Yann Martel, I was immediately feeling the same vibe that I had from Hugo in 2011. This feeling was amplified further upon learning that it was going to be directed by Ang Lee, a versatile director, who has yet to be grounded in one particular genre. Both films are fantastical adventures to an extent, which utilize a theme of storytelling at their core. They are also both visual delights, with the use of 3D actually amplifying the experience as opposed to taking away from it. 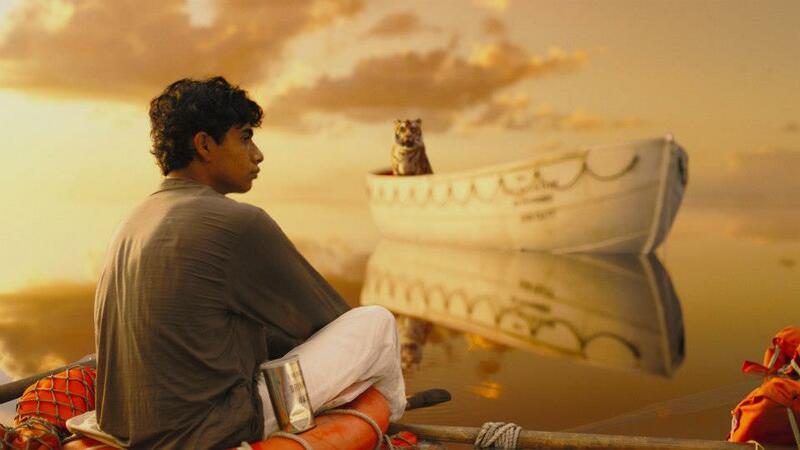 Life of Pi works on many levels and is certainly suited to a release at this time of year, as it is an incredibly earnest, yet exciting film and a visual treat for families to see, but one that has a lot more on its mind as well. The film has a very specific framing device that is not necessarily a spoiler, but one that I will refrain from delving into. What matters is that a man (Irrfan Khan) is telling a story to a journalist (Rafe Spall) about the journey of a 16-year-old boy attempting to survive an impossible situation. The boy is Pi (Suraj Sharma), who must survive on a lifeboat, following the sinking of a freighter ship he was a passenger on with his family, initially sailing from India to Canada. Pi’s father owned a zoo and they were on the freighter along with all of the animals as well, so following the sinking of the ship, Pi is joined on his lifeboat by several animals: a zebra, an orangutan, a hyena, and a Bengal tiger named Richard Parker. 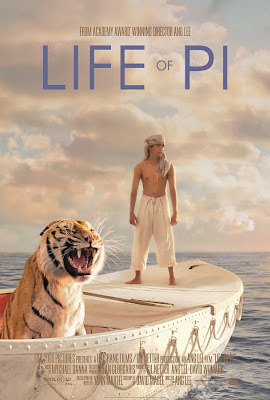 It is no easy task to survive this sort of situation and Pi is eventually faced with living on his lifeboat (and an attached floating raft made up of life jackets and wooden boards from the boat) with just Richard Parker, who would happily eat Pi, if given the chance. Of course, the two will have to learn to survive together, if at all, if they ever want to reach any sort of salvation. 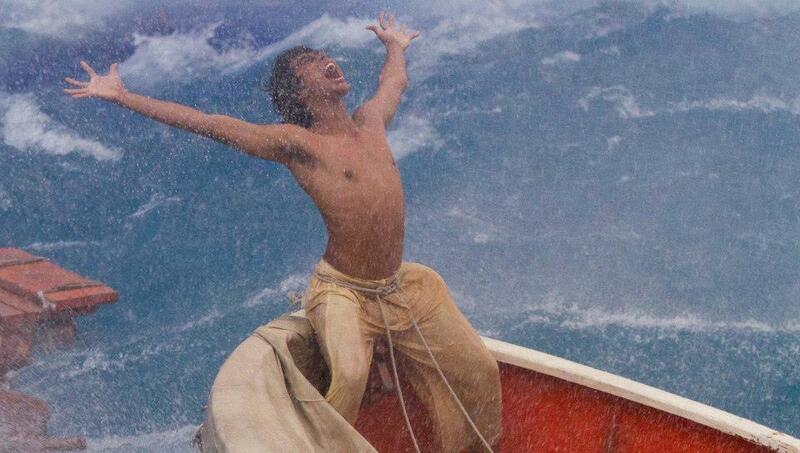 The film great to look at, which is important as the majority of the runtime takes place on the ocean, as we watch a character have his faith in anything tested. Instead of being minimal in its presentation, the film has gone on a very ambitious route, effectively bringing to life all of the splendid and exciting visuals that are a part of Pi’s journey. The animals all look great, various sea life is wonderfully represented, and the depiction of the freighter sinking is among the best boat sinking sequences brought to the screen. There are also some incredibly intense storm sequences that further keep things very compelling. 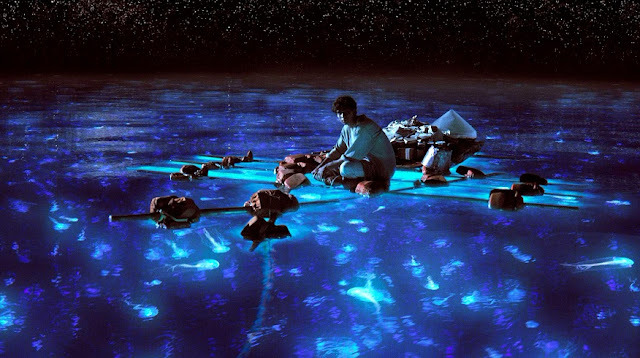 The cinematography by Claudio Miranda is pretty amazing, finding incredibly awesome ways to present the open sea, the undersea aspects, nighttime visuals, and other important visual elements that fully flesh out this story. It is a combination of this splendid photography with the fantastic CGI that makes this film is able to exist on a plane of reality that is rubbing up against the line of the fantastical so carefully. Getting past the visuals, I was really taken by how this story was presented, as it is less about whether or not Pi will survive and more about how Pi’s faith is being tested. Pi, as a character, is given plenty of setup before the film kicks into the ‘marooned at sea’ portion, which is very important, as we can accept who this person is and watch him grow. As an example, Pi was born Hindu, but he adopts several ideologies at a young age. He is also very into the idea that he and other animals can be seen as one, as everything, in his eyes, has a soul. Given this ordeal that he eventually faces, the idea of coming to understand God is a very important one in this film, but not in a way that feels too heavy-handed (though I can certainly see the argument that it is). There is a definite emotional undercurrent that is reliant on one man dealing with his faith, but not in a self-important sort of way. Performance-wise, while I really enjoyed Irrfan Khan’s telling of the story, newcomer Suraj Sharma does great work, given that the film is a one-man show for a long time. He goes through a physical change throughout this film, which informs the state of his character on a mental level as well. We know Pi is smart from the start, but the way he develops as a survivor, especially in the way his relationship with Richard Parker develops, is crucial to this story and very well reflected in how Sharma brings Pi to life. Getting back to Irrfan Khan though, the way he tells this story is quite important, as he is relaxed and confident in telling it, but there is a level of sadness in his eyes as well, which leads to one of the more interesting aspects of the story, by the time he has finished telling it. That said, if there is an area that has the most issues, it is in the way the framing device is used for expository purposes that are not always able to keep the energy of the film moving as successfully. Not for a lack of trying though. Ang Lee has directed a superb film in many ways. Sure, it is incredibly earnest in its presentation, but it is also frequently exciting and breathtaking at times, with various moments of levity that go a long way in helping out a story surrounding the plight of a man trapped in close quarters with a ferocious tiger. The technical aspects of this film are also outstanding, as it is one of the best 3D presentations that is certainly worth viewing on the big screen and has a great handle on mixing in the animal life with the humans present in this film. Most importantly though, Life of Pi is a film that is able to make a journey like this resonate on an emotional level in the midst of showing off the spectacular. Pi: It's important in life to conclude things properly. Only then can you let go. Otherwise you are left with words you should have said but never did, and your heart is heavy with remorse.